Venture into the snow-covered lands of the Yeti! This online video slot by Nolimit City starts off as a 5 reel and 3 rows game. Both inbuilt bonus features can trigger the expanding of the grid to spread over a total of 7 rows. The starting bet is €0.10, but if you feel like Lady Luck is on your side, you can raise the stake to up to €100. The combination of medium-volatility with an RTP of 96.16%, make spinning the reels of Ice Ice Yeti an electrifying experience. During the main, at any moment, the Yeti Shake might be triggered randomly. Anywhere from 2 to 10 ice covered positions will become active. Land a Yeti Wild and 2 to 3 ice blocks will become active and 1 Re-Spin will be added. Once triggered this feature will stop when no additional sticky symbols land. 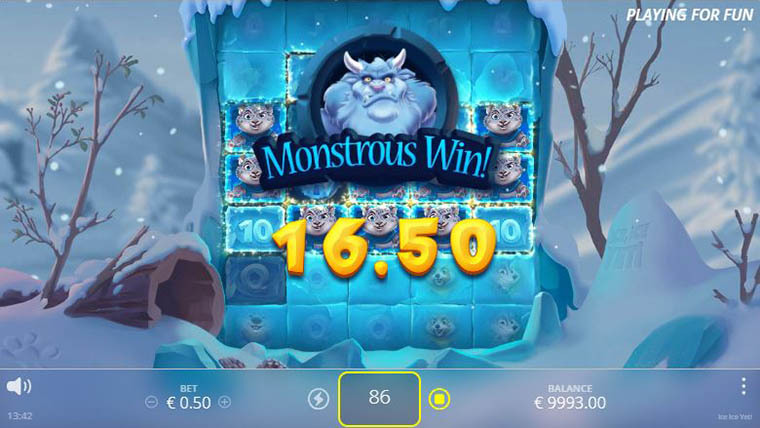 Why play it: Ice Ice Yeti is the game to play if you are a fan of legendary creatures, snow décor and unique slot game mechanics.